The solemnity of the Mother of God, which now coincides with the octave-day of Christmas and the beginning of the new year, was probably assigned this day because of the influence of the Byzantine Church, which celebrates the synapsis of the most holy Theotokos on December 26. This is in accordance with the Eastern practice of honoring secondary persons on the day after the feast of the principal personage (in this case, the birth of Christ). The Coptic Church celebrates this feast on January 16, but in the West, as early as the fifth century, the feast was celebrated on the Sunday before Christmas, although in France it was celebrated on January 18 and in Spain on December 18. 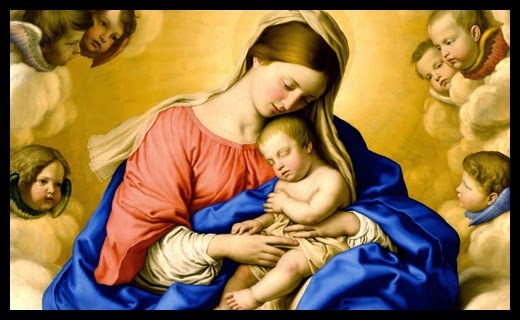 Even before Pope Sergius introduced four Marian feasts in the seventh century (the Birth of Mary, the Annunciation, the Purification and the Assumption), the octave day of Christmas was celebrated in Rome in honor of the Maternity of Mary. Later, in the thirteenth and fourteenth centuries, the feast of the Circumcision was added, although it had been introduced into Spain and France at the end of the sixth century and was later included in the Missal of Pope St. Pius V. The recent liturgical reform has restored the original Roman practice, which replaced the pagan feast of the New Year, dedicated to the god Janus, with this feast honoring the Mother of God. A popular movement began in Portugal in the eighteenth century for a feast honoring Mary's maternity, and in 1914 the date of the feast was fixed at October 11. It was extended to the entire Latin Church in 1931, the fifteenth centenary of the Council of Ephesus. The restoration of the feast to January 1, which falls in the Christmas season and has an ecumenical significance, coincides with other anniversaries; for example, the octave day of Christmas, the circumcision of the Infant Jesus (assigned to the first Sunday of January); the feast of the Holy Name of Jesus (which dates back to 1721); and the day for peace, introduced by Pope Paul VI. In the encyclical <Marialis Cultus> (1974) Pope Paul VI states: "This celebration, assigned to January 1 in conformity with the ancient liturgy of the city of Rome, is meant to commemorate the part played by Mary in this mystery of salvation. It is meant also to exalt the singular dignity which this mystery brings to the 'holy Mother . . . through whom we were found worthy . . . to receive the Author of life.' It is likewise a fitting occasion for renewed adoration of the newborn Prince of Peace, for listening once more to the glad tidings of the angels, and for imploring from God, through the Queen of Peace, the supreme gift of peace. For this reason . . . we have instituted the World Day of Peace, an observance that is gaining increasing support and is already bringing forth fruits of peace in the hearts of many" (no. 5).